SKU: PD-KRAK. Categories: Pendants, Jeweled Pendants. Our Kraken has decided to retire from a life of drowning sailors and destroying pirate ships in exchange for a more peaceful existence. But you can still release the power of this beast when you wear our Kraken Pendant around your neck. Available in bronze and sterling silver, both set with an onyx stone eye. This sturdy pendant is almost 3″ tall (75mm). Included in the cost is a matching 18″ gold or silver-tone steel chain. 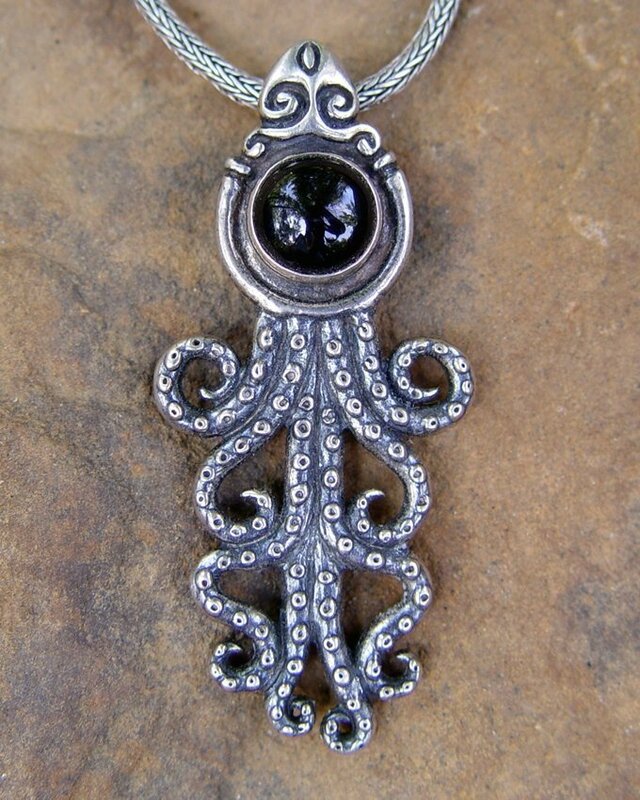 Based in part on the terrifying legend of the mythical beast and in part on the more peaceful creature depicted in ancient Minoan art, our Kraken pendant was made to honor the most intelligent inhabitant of the deep sea, the octopus! While the name ‘Kraken’ was attributed to the legendary sea monster thought to reside off of the coast of Norway, tales of the giant beast have excited the imagination of the seafaring adventurer since humankind first set foot in the ocean. A sea monster of gargantuan proportions, it was believed that the beast would rise out of the unknown depths of the ocean to grasp and crush ships with its tentacles. And from the more peaceful Minoan culture, the octopus (of a more manageable size) adorned pottery vessels and frescos.